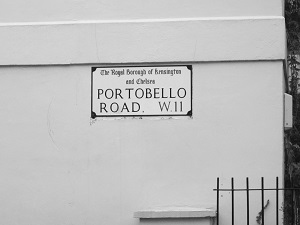 Today Spick & Span window cleaners went down to clean the windows of property on a street located seconds away from London’s famous Portobello Road Market. This elegant property situated very near to Portobello Road had windows that had not been cleaned for many years and they were in desperate need of cleaning. The windows that were cleaned were very high up, and at the front, where the window cleaning work began, the windows that were cleaned were, 3 large sash windows and 1 very large bay window. The windows were very dirty and had accumulated so much grime that they were very difficult to see through, and needed very thorough scrubbing with a window cleaning brush as well as rinsing with purified water, in fact because the stubbornness of the dirt and grime this window cleaning process was repeated twice, once at the start and again toward the end of the job. The window cleaner used a very large 40ft. 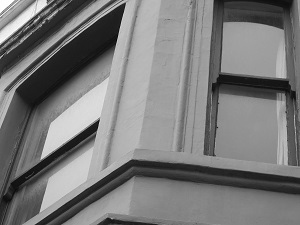 telescopic carbon fibre window cleaning pole to reach and clean the two sash windows on the fourth floor, as the windows were extremely high and difficult to reach by any other means. After all windows were cleaned on the outside at the front of the house, work commenced on the inside of the property were the window cleaner started at the top floor. This property, near Portobello Road, in total had 5 bedrooms, 3 cloak rooms, a kitchen and a lounge all of which had windows in that needed window cleaning. Traditional window cleaning methods were used inside the house and great care was taken not to drip water in areas of work. Particular care was taken in the lounge were a sash window was slightly restricted by the owners Piano. All windows after being cleaned were buffed with a lint-free cloth to leave a smear free finish. Because there was no rear access at this house located close to Portobello Road all windows that were cleaned at the back of the property had be cleaned from inside the property, fortunately for the window cleaner most of the sash window slid without much difficulty although some of the windows were harder to clean because, they had been painted shut. The window on the roof terrace partly opened giving enough room for the window cleaner to climb out and clean from outside. The windows in the kitchen were cleaned by using a micro fibre cloth. During the cleaning of the windows of this property in Notting Hill the homeowner had left the property to go to the bank and upon returning. She was thrilled to see through her windows, that were now sparkling clean.